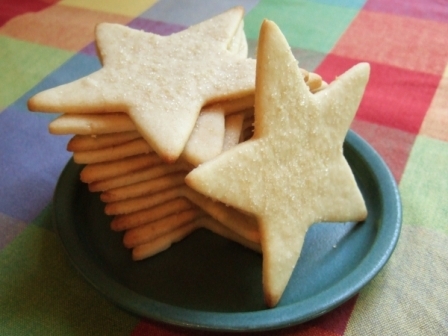 These cookies are crisp, with a light lemon flavor. Be sure to use a firm margarine; tub margarines work fine if they say they are suitable for baking, (I used Smart Balance). This recipe makes a soft dough, so for best results, work with a portion at a time when you're rolling it out and keep the rest in the refrigerator until you're ready to use it. Scraps should be chilled before they are re-rolled. If you like instead of sprinkling the unbaked cookies with sugar, glaze the baked , cooled cookies with a mixture of 1 cup confectioners' sugar and a few teaspoons of lemon juice. Mix until ingredients are well blended. Wrap dough in plastic wrap and chill thoroughly (at least two hours). Preheat oven to 375 degrees. 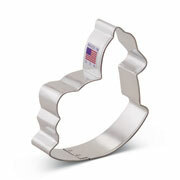 Roll one-third of the dough at a time on a lightly floured counter to 3/8" thickness. 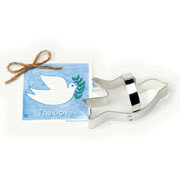 Cut with your favorite Ann Clark Ltd. cookie cutters. 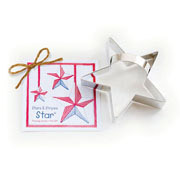 Place on a parchment-lined cookie sheet and sprinkle with additional sugar. Bake 8 to 10 minutes, until lightly colored. Let cookies cool slightly on the cookie sheets and then transfer to a wire rack to cool completely.